Ultrasonic inspection. Application of phased array technologies. Tecnatom, s.a., Avda. Montes de Oca, 1, 28709 San Sebastián de los Reyes. Madrid. Spain. One of the constant objectives of the ultrasonic inspection of electricity generating plant components is to increase the quality and reliability of such inspections, reducing inspection times, dose and costs. In this context, recent years have seen application of the phased array technique. A new family of probes has been developed for application of this technique, along with new mechanical and data acquisition equipment and new data analysis and simulation programs. - Inspection of CRD J-welds from the inside of the control rod housing in BWR reactor vessels. - Inspection of turbine blade attachment in service inspection through the central bore. - Inspection from the outside of the inner radius of BWR nozzles. The objective of this type of inspection is to detect cracking in the CRD guide-tube, the inspection being performed from inside the control rod housing through the J-weld window. The geometry of the component to be inspected is represented in FIGURE 1. To date, the ultrasonic inspection of these areas had been accomplished using conventional probes in direct contact, with water being used as the coupling medium. The technical objective set out in designing this inspection with array probes was to be able to work with a single probe capable of introducing both transverse and longitudinal waves in the steel, covering the entire range of possible angles and focusses. With this aim in mind, an annular array probe with 7 concentric elements and a frequency of 2 MHz was used, installed on a mechanical device with a rotating mirror (FIGURE 2). By rotating the mirror the type of wave and the angle of entry of the ultrasonic beam in the steel are selected. Focussing at different depths is accomplished by varying the excitation times of the array probe annular crystals. With a single probe it is possible to achieve a wide range of ultrasonic beam entry angles in the steel, with both longitudinal and transverse waves. A narrow ultrasonic beam may be used in the area of interest. Defect characterization may be improved thanks to the variable focussing. Inspection times and doses are reduced. The procedure generated has been successfully used for the inspection of nuclear power plant CRD?s, the objectives mapped out having been entirely satisfied. The objective of this inspection is to detect thermal fatigue-induced cracking in the blade attachment of medium and high pressure turbine rotors. The geometry of the components to be inspected is shown in FIGURES 4 and 5. To date, inspection of these areas had been performed using visual inspection and magnetic particle techniques. These techniques require that the turbine blades be extracted, destroyed and replaced, this greatly increasing the problems involved in inspection. The technical objective mapped out in designing this technique was to develop a ultrasonic technique through the central bore that might replace visual and magnetic particle inspections. The lengthy sound path through the material. The large difference in the thickness of the different crowns. The limitations on the ultrasonic beam accessing the entire volume of interest during inspection from the central bore. The ultrasonic technique selected for development with array probes was the immersion pulse-echo method, with light oil being used as the intermediate fluid. 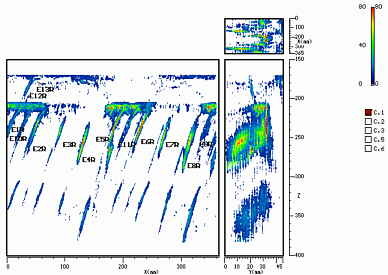 Following definition of the defects considered as being critical, it was decided that three probes would be required for detection: Two 01 and 151 longitudinal wave probes and one 451 transverse wave probe. The 01 probe would be used to detect defects in both types of blade attachment, while the other two would be used only for AT-shaped circumferential blade attachment. Three probes were designed and manufactured, these having an external diameter of 100 mm in order to have a small focus diameter in the area of interest. 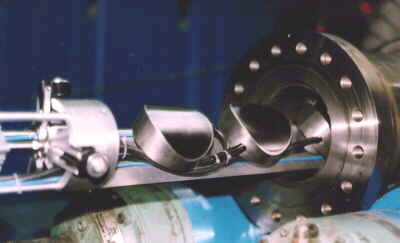 The active surface of these three probes is Fermat curvature shaped to correct the distortion of the ultrasonic beam that occurs when this beam impinges on the interface between the steel and the oil. In addition, the 01 probe was designed and manufactured with 16 annular rings with a view to allowing for variable focussing and thus be able to cover the different thicknesses corresponding to the two types of blade attachment. For correct performance of the project it was considered necessary to design and manufacture a calibration block representative of the two types of blade attachment. In the areas of this block considered to be most critical for defect growth a series of notches measuring 0.2 mm in width and from 2 to 4 mm in depth were machined. FIGURE 6 shows the calibration block and FIGURE 7 a detail of the defects that normally appear in these components. For performance of the inspection mechanical equipment capable of displacing the three probes at the same time was designed and manufactured, the probes being attached to a probe-holding module. This device makes it possible to carry out all the acquisitions in one run, without the need to lose time emptying and refilling the central bore with oil. FIGURE 8 shows the probe-holding module used. Circumferential scanning is performed by rotating the rotor through 360 ° by means of a clutch controlled by an electrohydraulic system. This made it possible to maintain a pocket of air in the central bore, the inspection being carried out by submerging in oil only the active part of the probes. 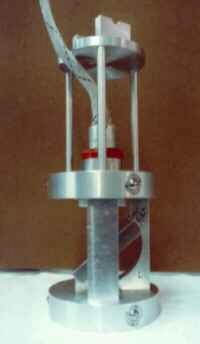 Axial movement of the probes is accomplished by means of an external motor. A destructive testing method is replaced for a non-destructive technique. The procedure generated has been used successfully for the inspection of blade attachments, the technical objectives established having been successfully covered and the maintenance costs of these components having been notably reduced. The objective of this inspection is to detect thermal fatigue-induced cracking in the area of the inner radius of boiling water reactor (BWR) vessels, during inspections performed from the outer surface of the vessel. The geometry of the component to be inspected is shown in FIGURE 9. To date the inspection of these areas had been carried out using conventional ultrasonic probes; these guaranteed defect detection but at the cost of using more than one mechanical equipment unit, various probes and shoes and scans requiring long inspection times. Dimensioning by means of these techniques required labourious additional scans and calculations to determine the position of the probes and the defects, and the accuracy of the results obtained was not fully satisfactory. The technical objective mapped out in designing this inspection with array probes was to simplify and improve the sounding of the volume of interest with a view to reducing data acquisition time and facilitating defect detection and dimensioning. The sounding of a geometrically complex volume of interest from a no less complex scanning surface entailing difficulties in probe coupling. Results analysis, especially with regard to the positioning and dimensioning of indications. The ultrasonic technique selected for performance of the inspection with the arrays was the contact pulse-echo method, scanning from the surface of the outer radius. In order to cover the objectives of the inspection, an array probe with 16 elements and a frequency of 2 MHz was specified and designed, with electronic angle and focus variation. For characterization of the ultrasonic beams and calculation of the focal laws simulation programs were used, representing beam shape depending on the characteristics of the probe, the medium and the focal laws used for excitation of the crystals. 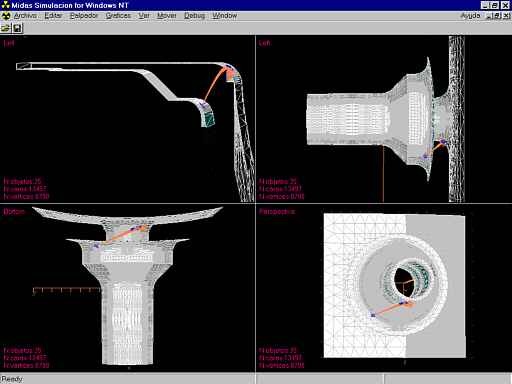 Computer-based simulation models were used to calculate the scan plans and automate calculations of positioning, these representing the probes and the ultrasonic beams issued by them on a nozzle. FIGURE 10 shows the screen of one of the simulation programs. The scan plan has been optimized, with the number of mechanical equipment units, probes and shoes having been reduced. An effective defect sizing procedure has been developed. Inspection times and doses have been reduced. The procedure generated has been used successfully for the inspection of nozzles in nuclear power plants, and has allowed the objectives mapped out to be met.